Burglary has been a constant threat to homeowners. As security systems improve so do criminals in their creativity. Just like wolves in the wild, criminals target the weak and vulnerable properties. Burglars become more insidious with their tactics. However, applying some simple techniques to stop a burglar from targeting your home will result in peace of mind going forward. We spoke to a former burglar and these are his top 10 tips to protect your home. If a burglar is targeting your area or even your street, they may look at every home and pick out the weakest. If they see a working alarm then this may deter many burglars from targeting that home. In the case of an alarm is triggered then at the very least it will attract attention from neighbours and/or other people passing by. Which would benefit the police with catching the criminal. This might seem a little obvious but if a burglar looks through one of your easily accessible windows, what do they see? Anything easily taken by a “smash and grab” means you’re at a higher risk of burglary. Keep things like a laptop or mobile phone, which are easily sold, out of sight will stop burglars from targeting your home. It’s not just electronics, passports and driving licences are also targeted. What do all burglars want to avoid? Getting caught!! Motion sensor floodlights are a way to put attention on a burglary. Another common way is the sound of a barking dog is triggered when a sensor is activated. As the “dog” is unseen it can deter a burglar, as they don’t want a run-in with an unknown animal. An organised burglar can mean they wait and monitor for a house to be empty. During the winter months it can be dark at 4 pm and if there are no lights on this presents itself as the perfect target. However, purchasing a timer (available pretty cheaply online) means you can set a lamp or light to come on at a certain time. This gives the impression someone is home and active, a little extra on the electricity bill outweighs the possible loss of possessions. A common approach for burgers is to post a takeaway menu and come back a few days later to see if it’s been moved. If the menu is still visible then this indicates no-one is home. Ask a neighbour/friend/family member to go round every other day to just move the mail away from the letterbox. Burglars don’t like anything which could cause them harm. They don’t know that Max the Labrador is actually a big softy. If there is a chance they will meet a dog then it might just deter them from it. Obviously getting a dog is a big deal and long commitment, please make sure you think about it… they’re not just for Christmas. This is a modern technique which is used by criminals in today’s world. Is your Facebook profile available for everyone to see or just your friends? If you’ve just checked into your hotel on holiday and decided to share that on Facebook tagging all your family. You’ve just told everyone that no one is in your home! This gives burglars the green light to break into your home. Make sure your privacy setting is just for friends only or go one step further and don’t tell everyone that you’re not in the country. Share your photos when you get back! Modern technology is evolving every day. However, with the evolution of keyless technology and especially with car companies, criminals are targeting these certain cars and are now able to steal cars without needing to break into the property. Just having a device near the key they can steal the signal and unlock the car. Easy prevention is to use a key safe which prevents criminal steal the car through the keyless technology. Reformed burglars have stated that homes with overgrown gardens are a better target as it gives them places to hide and scope out a potential target. It can also give the burglar the incentive that no one is in the house or have been away. Get your inner Ground Force out and tidy those bushes and cut that lawn it’ll be worth it. 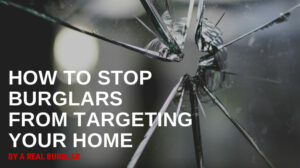 So there are 10 little tips and hints to stop burglars from targeting your home. All these little 1% preventions make your home less attractive to burglars. However, in some cases burglars will still target a property and making sure you have the right insurance is critical. Many people have high-value items in their homes which they do not declare to insurance companies and therefore are not covered. Ravenhall Risk Solutions are chartered insurance brokers and as you’d expect from a general insurance broker, we can provide insurance protection for the people, property and possessions you care about. But rather than just fit you to the policy, we prefer to talk through exactly what you need from your insurance cover. That way, you can be confident that you’re fully covered for all the surprises life may throw at you. Speak to a member of our specialist personal team to chat about your personal home insurance. « Can you fly during your first trimester?